Sometimes, there’s nothing better than sitting outside on the deck with your husband and your dog with a refreshing popsicle in your hand and a sticky drip running down your arm. 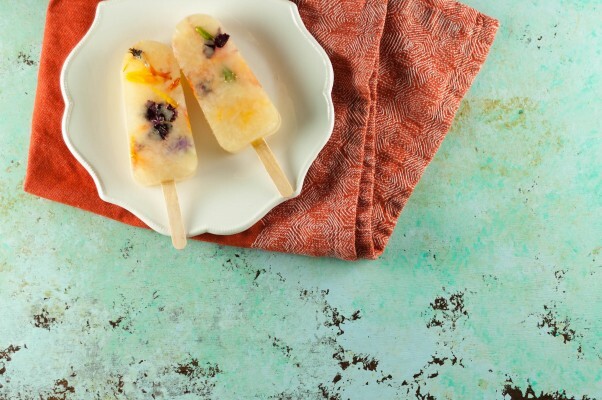 Like watermelon, I think popsicles are meant to be eaten outdoors in the open air on a hot and sunny summer day. 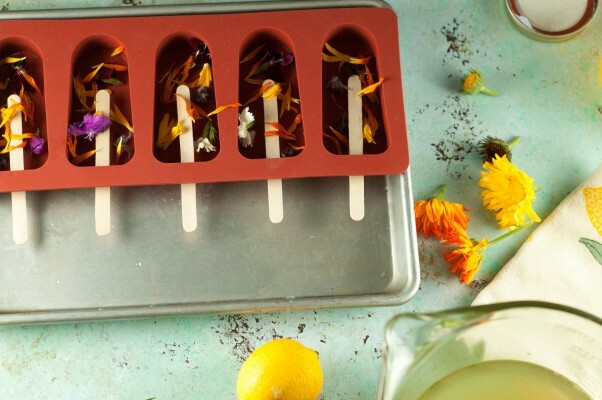 These lemon elderflower popsicles are studded with edible flowers that I got from Growing Power at the Green City Market, and they’re easily some of the prettiest ice pops I’ve ever made. It’s easy to forget about floral flavors or to dismiss them as tasting like a grandmother’s perfume. And if you overuse them, they can quickly cross over into that territory (in my experience, I’d recommend being especially conservative with rose water and Creme de Violette). But let’s not forget that vanilla comes from orchids. Elderflower, especially when mixed with citrus like lemon, is, I think, a floral flavor that’s easy to love. 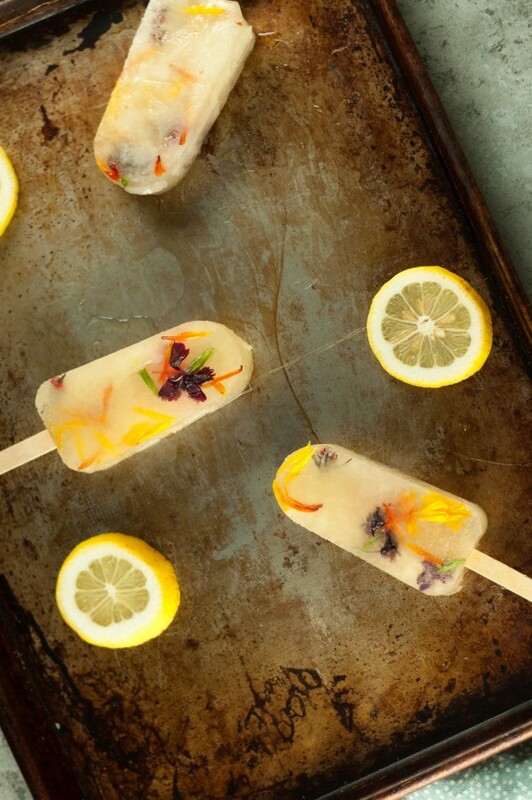 And these popsicles remind me, again, why I was so eager to bring home a flat of elderflowers when I saw them at the market. 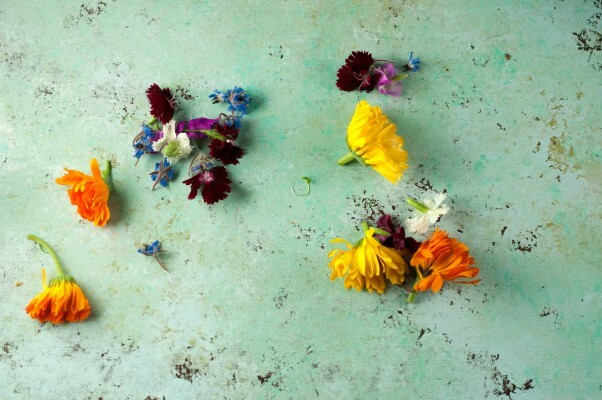 I think the lemon and elderflower flavors make a fitting backdrop for this colorful bunch of edible flowers. 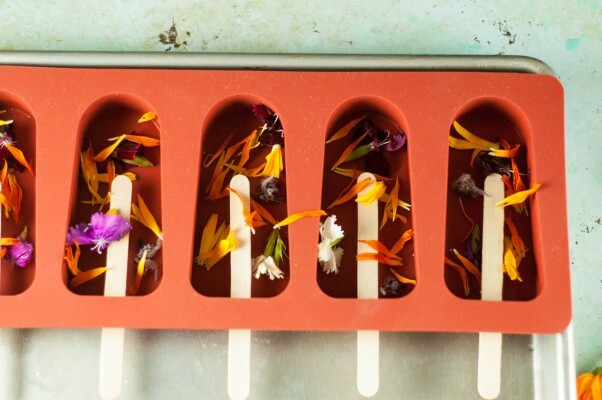 These particular edible flowers are a mix of sweet william, borage, and calendula blossoms, and they add vibrant color and contrasting textures to these ice pops. 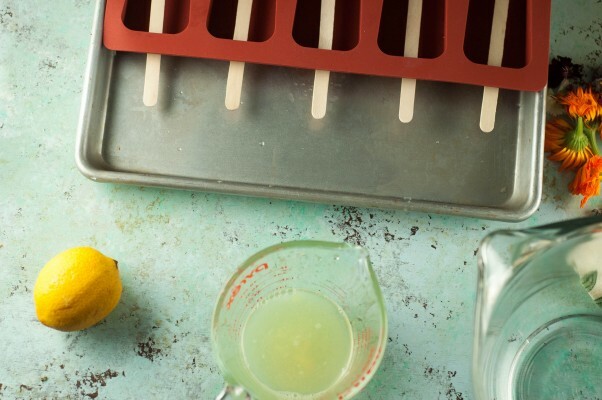 Like most popsicles, these delicate, citrusy beauties are a cinch to make. 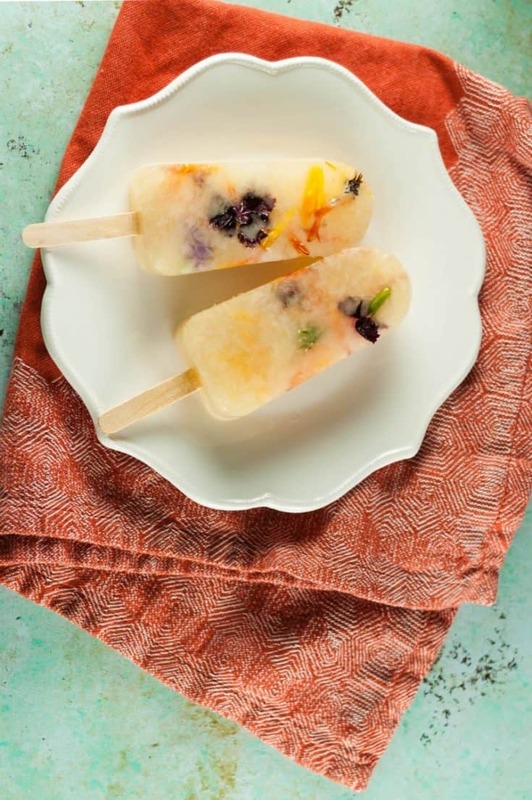 Just mix some elderflower cordial (either homemade or a commercial variety) with some water and lemon juice, scatter some edible flowers into molds, pour the liquid mixture over them and carefully transfer to the freezer until they’re frozen solid. You can always skip the extra flowers if you don’t want to bother. Really they’re mostly just showing off. 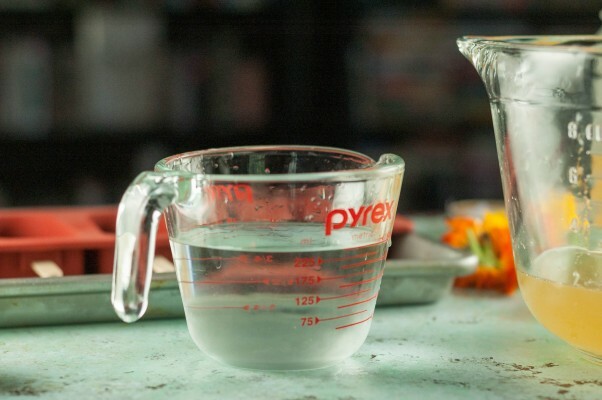 In a mixing bowl combine the elderflower cordial, water, and lemon juice and stir. 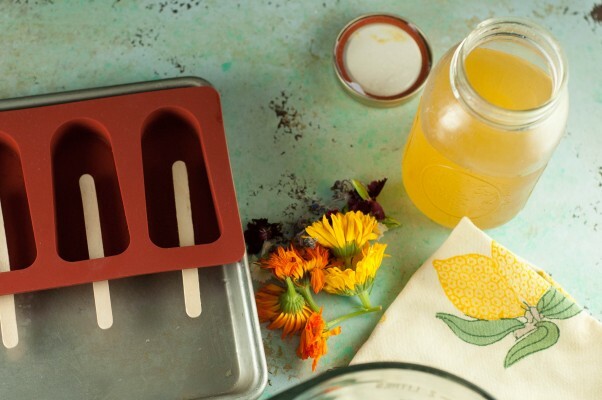 Scatter the edible flowers over the popsicle molds and pour the liquid into the molds. Transfer to the freezer and freeze until solid, about 4-6 hours or overnight. These are beautiful! Alllllmost too pretty to eat but they also sound delicious ; ) Thank you for sharing the lovely photos and fantastic recipe! Ha! The dog got the bits that dripped onto the deck, but otherwise, we humans selfishly guarded these. Great addition for parties to WOW your guests!